Apparently being in a special club with the likes of Julianne Moore, Conan O'Brien, and Dana Scully doesn't mean redheads have it easy. Everyday our flame-haired friends are experiencing discrimination when they try to make a donation at the sperm bank. According to The Telegraph, Croyos, the world's largest sperm bank, has seen a surge in donations in recent years. The Danish companies' shelves are now brimming with 70 liters of grade-A sperm, which will be shipped to more than 65 countries worldwide. Donors receive up to $500, and there are currently 600 men on the waiting list. "There are too many redheads in relation to demand.I do not think you chose a redhead, unless the partner — for example, the sterile male — has red hair, or because the lone woman has a preference for redheads. And that's perhaps not so many, especially in the latter case." Cryos has a large customer base in Spain, Italy and Greece, and most of the customers in those countries are interested in making brown-haired, brown-eyed babies. Fortunately, there are still some areas where a ginger tot is appreciated. 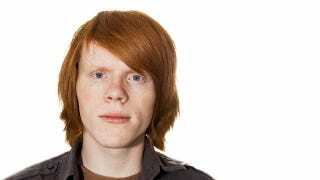 Schou says samples from redheaded donors are still selling "like hot cakes," in Ireland.